America's native red maple grows fast; the October Glory red maple cultivar grows faster. Speed of growth is not the only reason this maple is so frequently used in home landscapes. A showy tree, it dances into spring with tiny, crimson flowers that transform into fruit of the same color. Its shiny green leaves blush a rich red in October and hold on the tree for weeks. The ideal time to plant this deciduous tree depends on several factors. Draw a line from Minnesota to eastern Texas; the red maple thrives in most of the states to the east. The red maple, Acer rubrum, tolerates a wide range of soil types, from dry uplands to peat bogs and swamps. It thrives in both very wet and very dry areas. 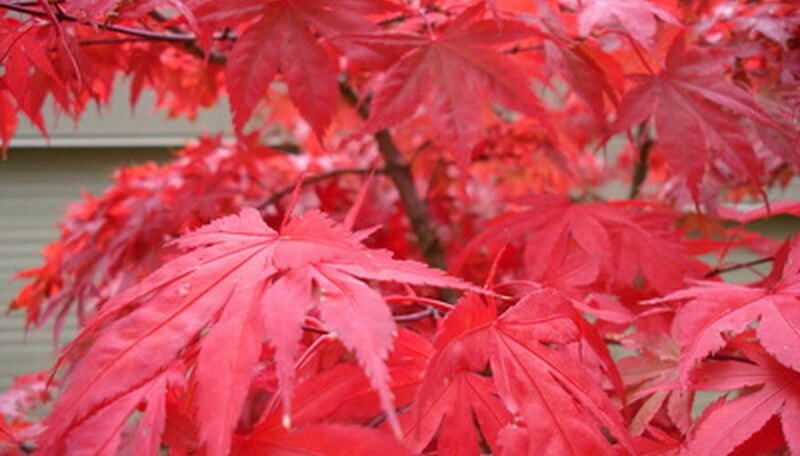 One of the first trees to leaf in the spring, its crimson leaves are easy to recognize in fall. In the wild, the maple sows its abundant seeds between April and July. To grow an October Glory maple from seed, use that time frame. Most homeowners purchase young October Glory maple saplings from plant nurseries. Sometimes nurseries offer maple trees for sale in early spring without any soil around their roots. These bare-root maple trees started life in fields and need to get their roots back into the ground as soon as possible. Plant bare-root October Glory maples immediately after purchase. Since this species is among the first to leaf in the spring, quick planting is essential, while the tree remains dormant. Nurseries offer young October Glory Maple trees with a ball of soil around their roots, generally encased in burlap. Plant these root-ball trees while they are dormant -- before they get leaves in the spring or after leaf-drop in the fall. Spring often proves the better choice. Since October maples hold their leaves long after other trees are bare, fall-planted maples may not have time to develop roots before winter. If you want more flexibility about when to plant your new maple, buy one in a pot. A container-grown October Glory maple costs more, but it arrives at your house in the pot in which it sprouted. Since the tree's root-system remains intact, a potted tree does not need to establish roots before winter weather. Plant container-grown maples whenever you like, as long as the ground is not frozen and the heat is not extreme. National Forest Service; Acer Rubrum, Red Maple; Russell S. Walters, et al.